As a person whose grandparents had to go through the Holocaust and lived through those terrible times, so that me and my cousins wouldn’t have to see this today, learning of the anti-Semitism that still prevails and affects our lives is heartbreaking. 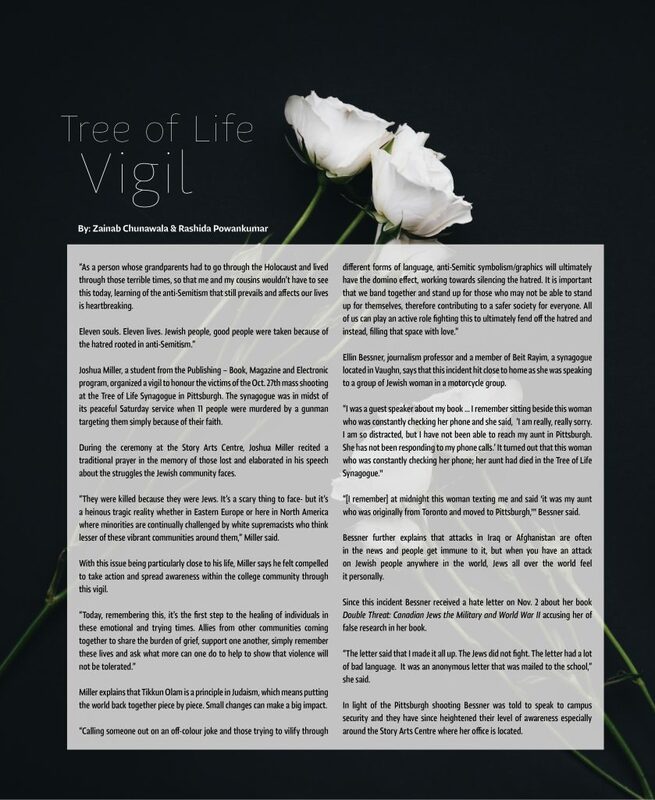 Joshua Miller, a student from the Publishing – Book, Magazine and Electronic program, organized a vigil to honour the victims of the Oct. 27th mass shooting at the Tree of Life Synagogue in Pittsburgh. The synagogue was in midst of its peaceful Saturday service when 11 people were murdered by a gunman targeting them simply because of their faith. During the ceremony at the Story Arts Centre, Joshua Miller recited a traditional prayer in the memory of those lost and elaborated in his speech about the struggles the Jewish community faces. “They were killed because they were Jews. It’s a scary thing to face- but it’s a heinous tragic reality whether in Eastern Europe or here in North America where minorities are continually challenged by white supremacists who think lesser of these vibrant communities around them,” Miller said. With this issue being particularly close to his life, Miller says he felt compelled to take action and spread awareness within the college community through this vigil. Miller explains that Tikkun Olam is a principle in Judaism, which means putting the world back together piece by piece. Small changes can make a big impact. Ellin Bessner, journalism professor and a member of Beit Rayim, a synagogue located in Vaughn, says that this incident hit close to home as she was speaking to a group of Jewish women in a motorcycle group. “[I remember] at midnight this woman texting me and said ‘it was my aunt who was originally from Toronto and moved to Pittsburgh,'” Bessner said. Bessner further explains that attacks in Iraq or Afghanistan are often in the news and people get immune to it, but when you have an attack on Jewish people anywhere in the world, Jews all over the world feel it personally. Since this incident Bessner received a hate letter on Nov. 2 about her book Double Threat: Canadian Jews the Military and World War II accusing her of false research in her book. “The letter said that I made it all up. The Jews did not fight. The letter had a lot of bad language. It was an anonymous letter that was mailed to the school,” she said. In light of the Pittsburgh shooting, Bessner was told to speak to campus security and they have since heightened their level of awareness especially around the Story Arts Centre where her office is located.